High quality Stainless steel hemostat with thin serrated tip. Excellent for ligating ligatures or placing elastics. Specifically designed with a curved tip for ligating posterior or lingual areas. All stainless steel construction with serrated jaws and smooth travel for ease and comfort. Excellent for labial or lingual use. Ideal for placing elastomerics and tying ligatures. All stainless steel construction with serrated jaws. Smooth travel for ease and comfort. Excellent for labial or lingual use. Curved tip facilitates easy access in difficult to reach areas. 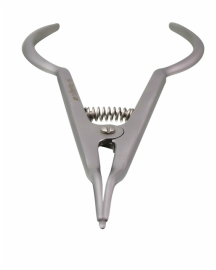 Handy, lightweight high grade stainless steel instrument provides easy access to areas that are difficult to reach. Grooved tips ensure positive hold for positioning separators effectively and safely. High quality, light and sturdy. Our tip is finely serrated on all sides for accurate and secure placement while banding. • Large-Diameter Handle - Reduces muscle fatigue for less risk of carpal tunnel syndrome. • Feather-Light Design - Allows for a relaxed grip which provides improved tactile sensitivity. • Textured Grip - Better gripping and rotational control. • Corrosion Resistant - Made with high quality stainless steel material.